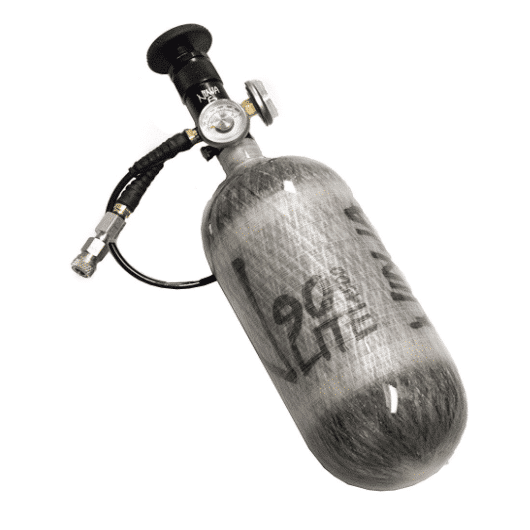 Everything you need to conserve air by Cascade Filling your PCP airgun from two SCBA 4500 psi carbon fiber tanks. 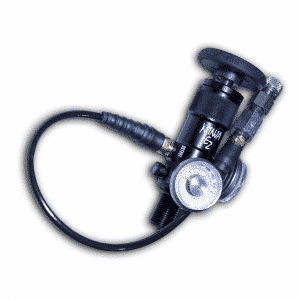 Cascade Man 24″ SCBA tank connector. Save Air by Cascade Filling Your PCP Airgun with Stickman & Cascade Man. 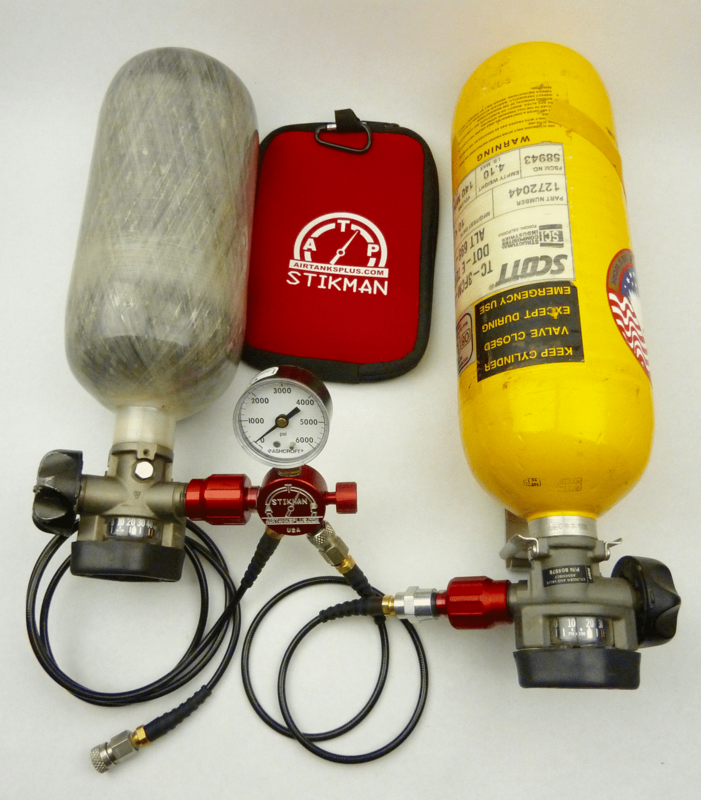 This portable and compact scba pcp fill system comes with a soft protective pouch. 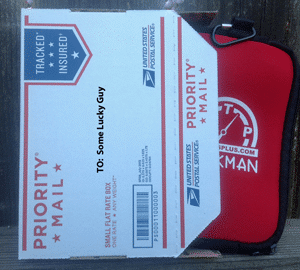 Inside you will find both the Stickman and the Cascade Man fill adaptors. The Male foster fitting on the right leg of Stickman incorporates a one way valve that lets air travel through stickman when used for cascade filling. 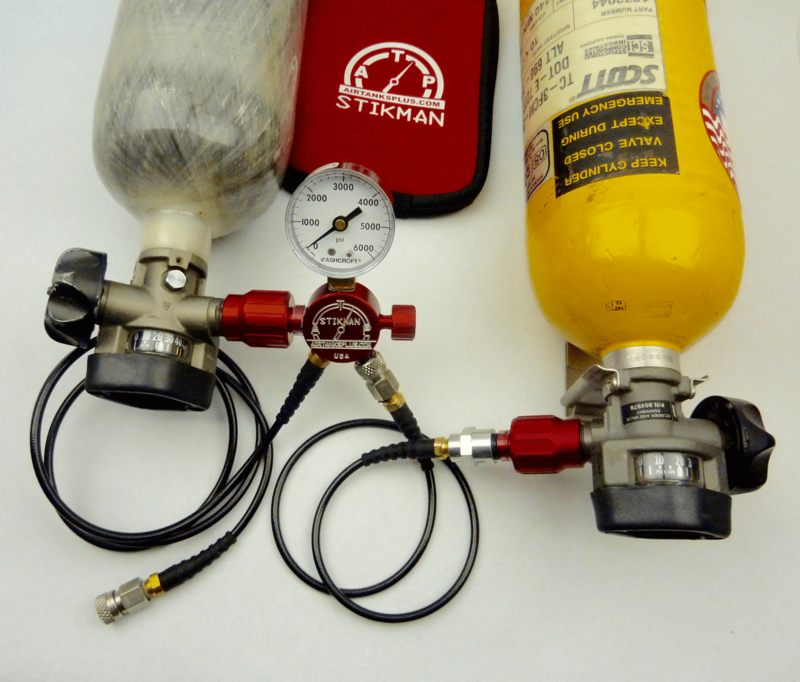 Air will not flow from stickman out the one way valve, so you can use the Stikman to fill from one scba tank (must be directly connected to Stikman) or Two scba tanks when a second tank is connected using Cascade man. The above pictures shows how the two pieces connect together. 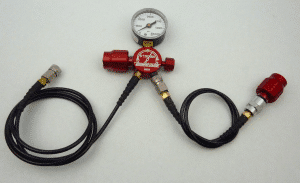 The hose on the left would go to the air gun or cylinder you are going to be filling. The Photo above shows how the system looks when properly connected to the two SCBA tanks. Please note I used small 15CF scba tanks to make it easier to show you the big picture. Normally you would do this with larger SCBA 44CF, 66CF, and 88CF 4500 psi carbon fiber tanks. 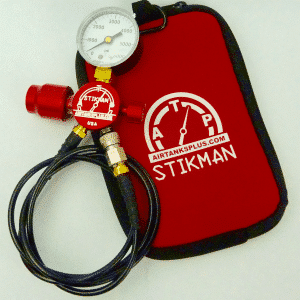 The tank with the highest pressure should be connected directly to the Stickman, and the lower pressure tank to the Cascade man. Though it would work if the order were reversed you would waste a small amount of air during the fill process if you connected the high pressure tank to the Cascade Man. This is because you would also be pressurizing the cascade man with the high pressure air when you don’t need to. At this point we will assume you have both scba tanks connected. 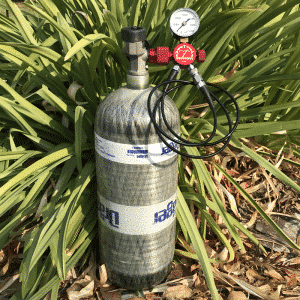 High pressure tank with the most remaining air is connected directly to the stickman with the hand tight cga 347 fitting. Low pressure with the hand tight to the Cascade Man. 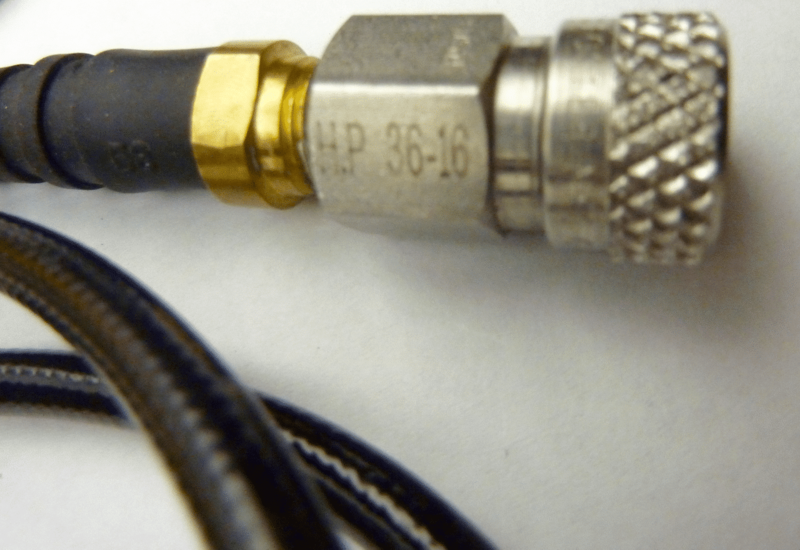 The male foster on the 48″ fill whip MUST BE Scurley attached and locked on to the Airgun or cylinder you want to fill. Give the female fittings a tug to ensure they are both securly connected. Make sure the bleed valve on the stickman is closed. Slowly open the valve on the lowest pressure tank (connected through Cascade Man.) Watch the gauge on the stickman climb. If you have enough pressure to fill your gun in the tank, then close the valve and bleed the system. If you run out of available air in the first tank to completely fill your air gun, close the valve. 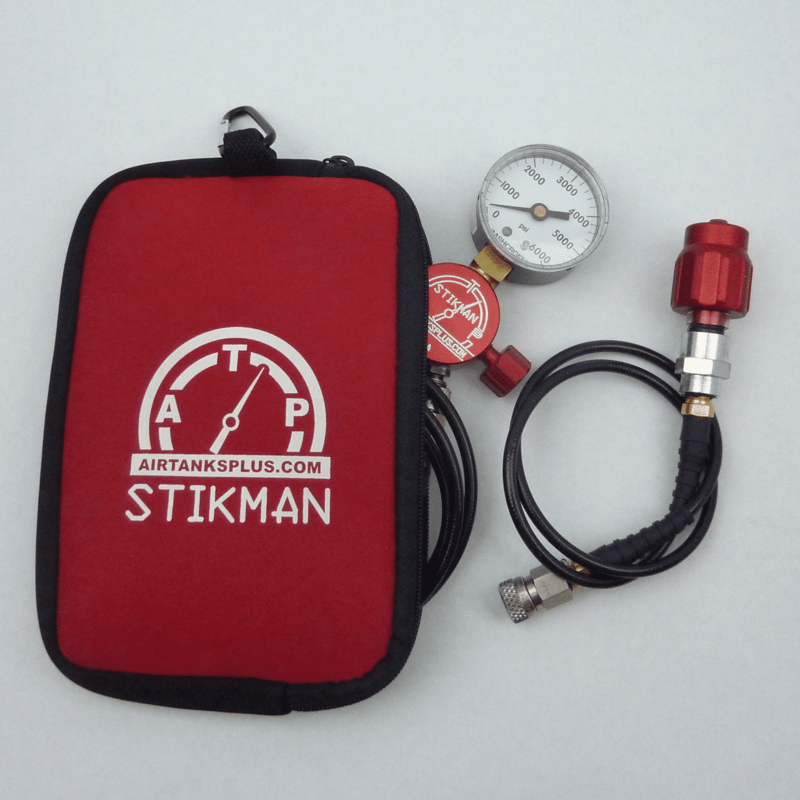 Now Slowly open the tank with the highest amount of air remaining ( the one directly attached to the Stikman) and while watching the fill gauge on the Stickman slowly top off your airgun to the desired pressure. Close the valve and wait a few seconds. You may notice as the air is the airgun or cylinder cools, the pressure may drop, this is normal. Just slowly crack the valve and add more air. When you are finished filling your airgun to your desired pressure. 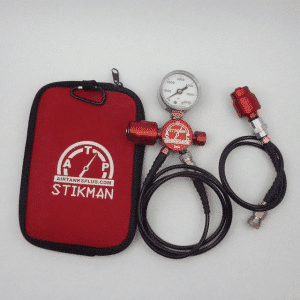 Make sure both valves are in the closed position, then open the bleed valve on the stickman. 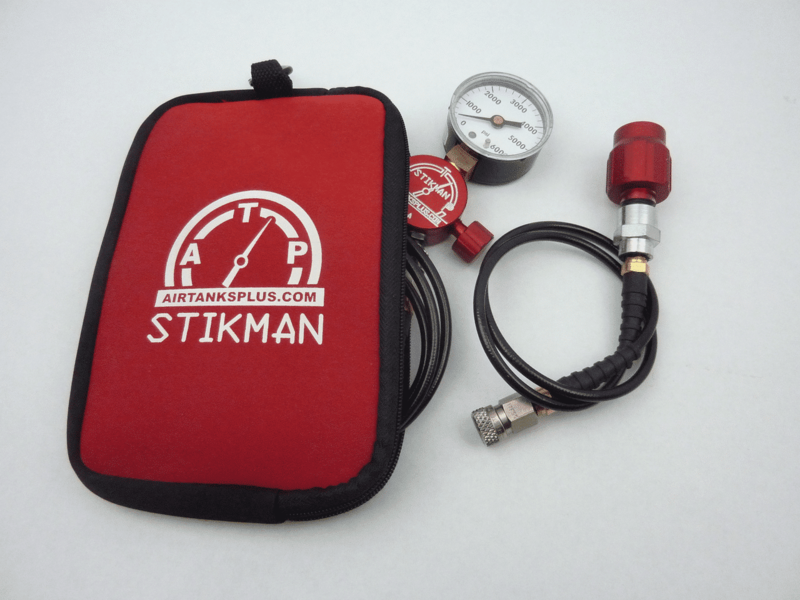 Stickman will safely bleed the air out the back, and away from you. Please note that you are resting the bottles on the ground dust or dirt may be blown around with force during the bleed process. With all the air removed from the system you can safely remove the fill whip form the airgun. 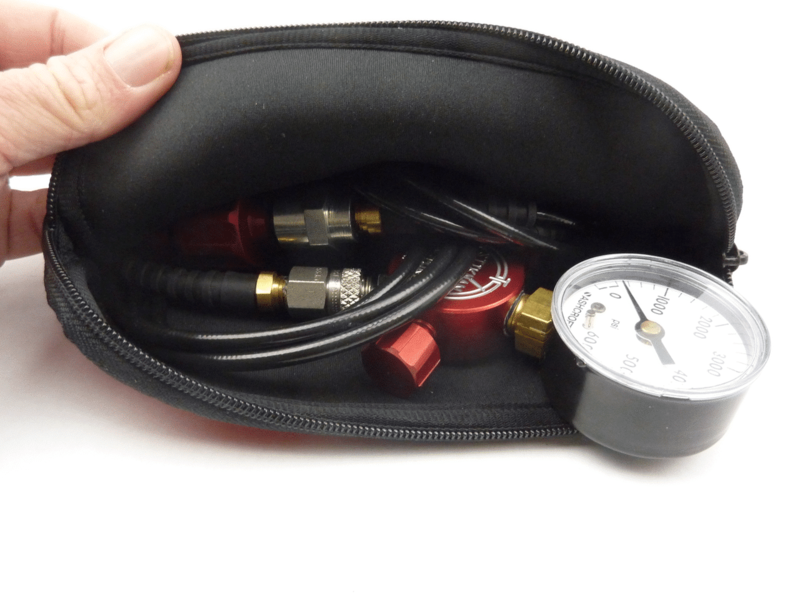 Eventually the low pressure tank will be too low to provide value on filling your airgun. At that point you can take that tank in to be refilled back to 4500 psi. That tank will now become your high pressure tank. Q. Can I use this configuration to fill both my large tanks at the same time if I filled from a male to male connector? A. No the male foster on stickman will only allow air in one direction.